$7,500 to help preserve one of the greatest populations of elephants left in East Africa by helping the game scouts that protect them. We received an urgent request to help 67 Maasai Game Scouts. 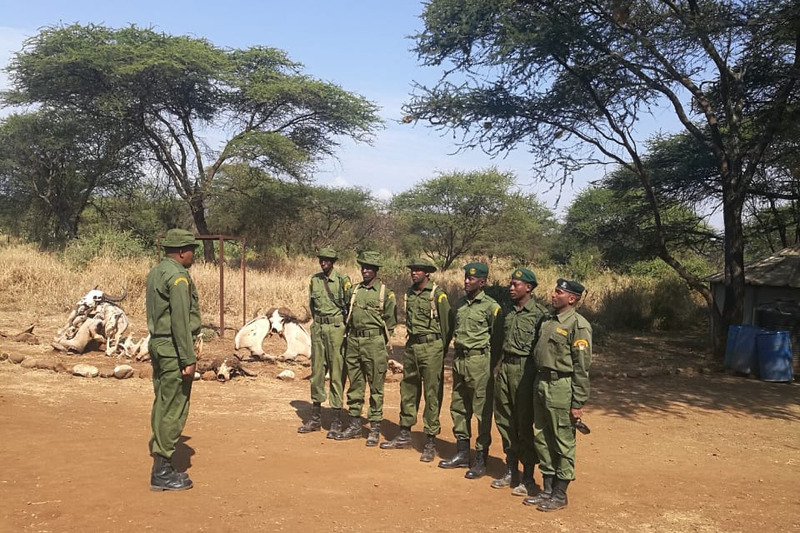 These scouts, who serve like rangers, prevent the poaching of elephants and other wildlife. They work within the Water is Life Kenya area of operation on the Kenya / Tanzania border just north of Mount Kilimanjaro. Maasai Game Scouts are critical to stopping the poaching of elephant tusks and slaughter of wild animals in East Africa. The valuable protection Game Scouts in our area provide for elephants, lions, giraffes, leopards, and gazelles, is at risk. Recently, the Scouts lost their funding. Suddenly, their partner pulled out, taking everything: including pots, pans, radios, and mattresses. Most noteworthy, they took the life-giving water tanks critical to survival in the long dry months between the rainy seasons. Thus the Scout Leaders begged our help. As a trusted community partner, they asked us to find food and 10,000-liter water tanks until a long-term solution can be found. Most importantly, Maasai Game Scouts are critical in stopping poaching and catching criminals. The Scouts patrol the area on foot looking for intruders and animal carcasses. Once observed they report suspicious behavior to Kenya Wildlife Service, the government authority in charge of protecting wildlife. As a result, supplies are running out. The 67 Game Scouts work out of 6 remote ranger posts in the deep bush. The Scouts are stranded without food and water and the minimal supplies needed to do their work. If they have no water and no food supply, how will they be able to patrol and protect, trekking through the wilderness every day? Without help, they are forced to leave their camps and return home. Resulting in the wildlife, our treasure, in the hands of poachers and criminals. Consequently, we have already taken funds from our existing programs to keep the Scout program in place for a few weeks. Thus, money raised in this GoFundMe Campaign replaces the funds we took from our existing programs. Because the need to continue the Game Scout program while a long-term partner is found is vital. Also, now is a critical time. The Great Migration is underway. Millions of zebras and wildebeest are on the move to find water as the dry season begins. 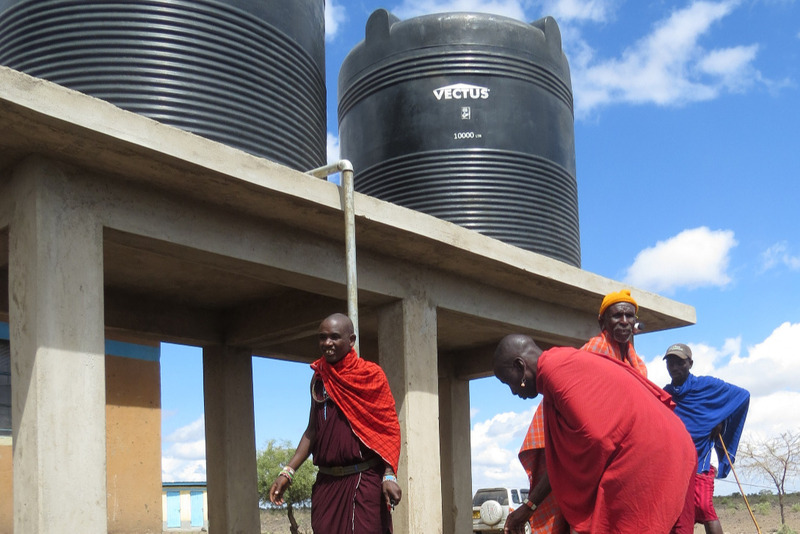 The tanks we will be installing look similar to these ones that we installed at one of our projects located in Enkongu Narok. Second, $4,500 – Four 10,000-liter water tanks, concrete platforms, transportation and installation at remote ranger sites. Water is Life Kenya is a 501(c)3 organization whose mission is to bring clean, accessible drinking water to communities in semi-arid regions. Our focus area is north of Mount Kilimanjaro, Africa’s tallest peak. This area also located north of the vast plains of the Serengeti, a UNESCO World Heritage site. We are proud that our clean water projects provide clean water to over 50,000 people every day. But water is not our only focus. In addition, we have a successful Livestock as a Business program. We train willing, committed and interested Maasai in the skills needed to improve the one resource they depend on – livestock.